Xolo is now growing rapidly and further increasing their Q-series Xolo launched the Q1100. Xolo Q1100 has a 5-inch 1280 x 720 pixels HD IPS display based on OGS technology. The phone is powered by a 1.4 GHz quad-core Snapdragon 400 (MSM8228) processor with 450 MHz Adreno 305 GPU. Running on Android 4.3 Jelly Bean it is promised to get Android 4.4 KitKat. At the back it has a 8MP camera with LED Flash and BSI 2 sensor. For seflies theres a 2MP front-facing camera. The phone is in direct competition with Motorola Moto G which share almost similar specs but lacks expandable memory. 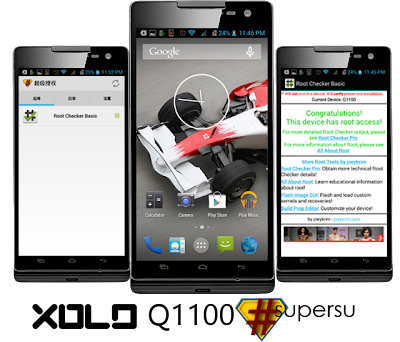 Rooting the Xolo Q1100 is a easy process thanks to a senior member ANDY at XDA. He made a rooting tool specially for Xolo Q1100. 6. Wait Till Device Reboot &.Root. And now all you have to do is enjoy your rooted device!